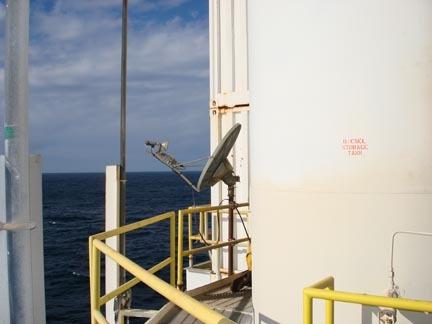 The two GPS stations (HARV and HAR2), on the Harvest Oil platform (Figure 2), which sits roughly 15 km off the coast of central California, were brought online December 15, 2006, after an extended communications outage. A HUGHES DW6000 VSAT dish was installed in a new location with a new mount (Figure 1), and is now providing full time internet access for the GPS and associated science equipment. A new dual shielded RG-6 cable was pulled through the existing conduit and into the shed where the modem and data download computer are located. Backlogged data from the site will be archived and made available in the coming months. We would like to acknowledge and thank the personnel on the platform for the help they provided in bringing this station online. 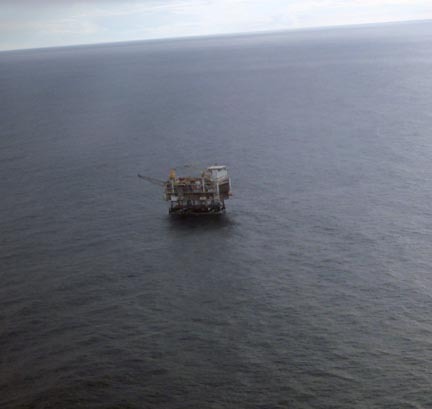 In addition to drilling for oil, the Harvest oil platform is also an important international resource for the study of sea level from space. Two satellites currently in orbit over-fly Harvest on a regular basis and record local sea surface height. Tide gauges attached to the platform continuously measure and record variations in sea level relative to the platform. Data from two GPS systems aboard (HARV & HAR2) are used to calculate the absolute height of the platform relative to the Earth's center. Combining the tide gauge and GPS results gives the local sea-surface height relative to the Earth's center. This is the same quantity measured by the radar's altimeter each time the spacecrafts pass directly over the platform. The two sets of values are then compared, and any difference between these values would be considered calibration errors. Minimizing these errors is accomplished by having a redundancy in instrumentation. For more information regarding this experiment, please see The Harvest Experiment .